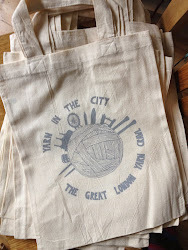 Yarn in the City: The Great London Yarn Crawl: Registration now open! Clicking on the link will take you to a new website where you can pay for your tickets using Paypal. The routes are listed separately, so you'll be buying a ticket for a specific route - make sure you get the right one! a one day Travelcard for zones 1-2, good for riding all necessary transport mechanisms (bus, Tube, train, Overground). You are more then welcome to use your own Oyster/Travelcard - in that case, the excess funds from your ticket price will be donated to Refuge after all the other expenses have been covered. special offers and discounts from some of participating shops, including both day of discounts and coupons for future purchases. And cake! entry to The Great London Yarn Crawl after party, which will have door prizes from some of the shops as well as UK-based independent dyers, and a special knitting-world guest! If anyone has any questions, please check our FAQs or leave a message in the comments. Super Summer - and a Sponsor!